The idea of casino expansion in Australia’s Gold Coast region has been the subject of debate and controversy over the years. However, the idea never seems to make any movement, forward or backward. Now, Queensland wants to know if there is interest in a second casino resort in the area and is giving casino operators the chance to weigh in. Gaming and hospitality operators can offer their opinion on the matter until April. The government introduced an expression-of-interest process on Tuesday to allow developers to present their interest on constructing and operating a second casino resort alongside the Star Gold Coast, located in the Broadbeach suburb. A “world-wide search” is now being conducted, according to Australian Minister for Innovation and Tourism Industry Development Kate Jones. The government is looking for the best proposal that would create a boost for the “tourism and entertainment” offering of the Gold Coast. The development would be part of a plan by Premier Annastacia Palaszczuk to create a Global Tourism Hub (GTH), similar to that seen in the integrated resorts of MICE (meetings, incentives, conferences and exhibitions) locations. The hub is expected to include, in addition to casino resorts, entertainment venues, convention facilities, retail stores, luxury hotels and high-end food and beverage venues. The hub will also have its gaming capacity limited. Jones states that the Queensland Government will cap the facility at 5% of the property’s total area, a similar limitation implemented for the integrated resort being developed in Brisbane’s Queen’s Wharf. Not everyone has been convinced. The GTH has received considerable resistance from anti-gambling pundits who assert that another casino in the region would be detrimental to the area. The Alliance for Gambling Reform’s Stephen Mayne told media outlet ABC that Queensland is the second-worst state in the country in terms of gambling losses, with an average of AU$1,000 (US$703) recorded per person. He added that the ability of the new resort to add new jobs to the area shouldn’t take precedence over the negative impact increased gambling opportunities would bring. The Star Entertainment Group, which owns the casino resort in Broadbeach, has its doubts, as well. However, and what is glaringly obvious, the company’s arguments for trying to prevent another casino are tied more to the potential loss in revenue more than to any altruistic concerns for the well-being of area residents. Star is set to invest over AU$2 billion (US$1.405 billion) to upgrade the Broadbeach property, adding five new towers and additional amenities. It is also ready to launch an integrated resort in Queen’s Wharf after the company’s bid was accepted by the government. 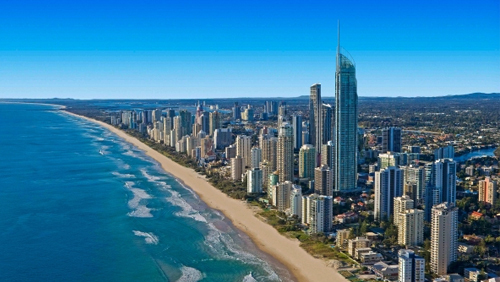 Some international casino operators have already expressed interest in launching resorts in the Gold Coast area and will most likely be preparing to introduce their plans through the expression-of-interest scheme. Among these are Hard Rock International and Caesars Entertainment, but more will almost certainly follow. The post Queensland wants to know if there's interest for second Gold Coast casino appeared first on CalvinAyre.com.